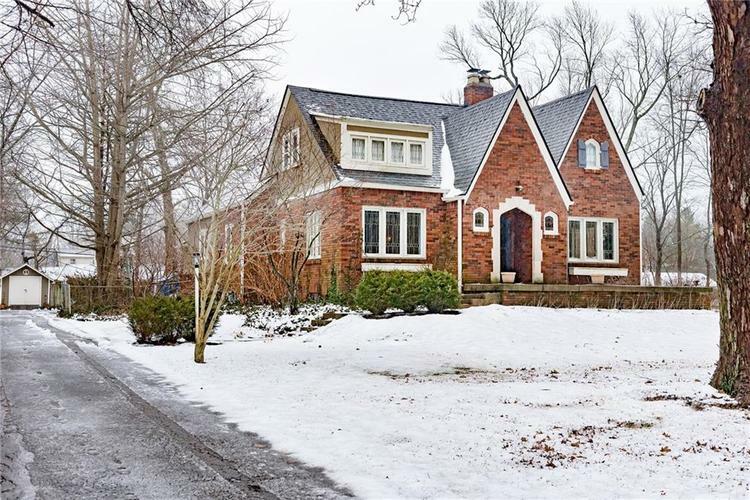 Beautiful brick Tudor charmer on 1.3 acre lot with mature trees & privacy close to John Strange Elementary! Lead glass windows, three fireplaces & hard-to-find spacious back family room with vaulted ceilings & loads of windows overlooking the private yard! Two bedrooms on the main floor & two upstairs. Large patio overlooks fenced back yard. Newer roof, original hardwood floors, crystal door knobs & built-ins. Kitchen features double ovens, cook top, microwave, dishwasher & peninsula island. Small cubby area off of garage. Walk-out basement with family room area, half bath & ample space for playroom, exercise room, etc. Two car attached rear load garage & extra storage space in walk-in attic. A must see! Directions:From Keystone Ave. & 62nd St., East on 62nd St., right / South on Ewing St.